Steiff Cosy teddy Cosy 2018 Year Beautiful Bear, 113321 ~ Free Steiff Gift Box! Steiff Bear Cosy teddy bear for 2018 is made from cuddly soft plush in a warm golden brown colour and has shiny black eyes and matching black hand embroidered mouth and nose. 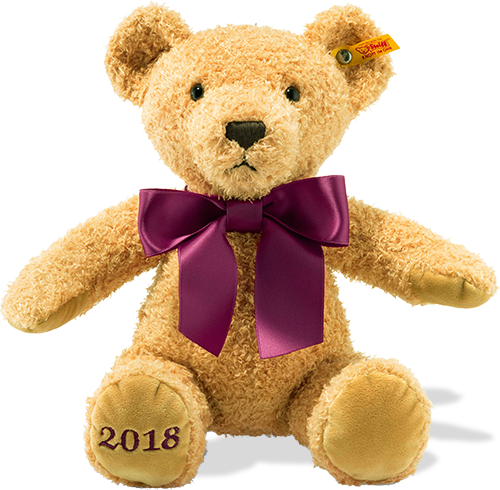 Wearing a shiny satin burgundy bow around the neck - and just look at this bears paw pads and you will see that Steiff bear have embroidered the year 2018 in a matching burgundy colour - so smart! A lovely gift for the one you love and perfect to celebrate special events.